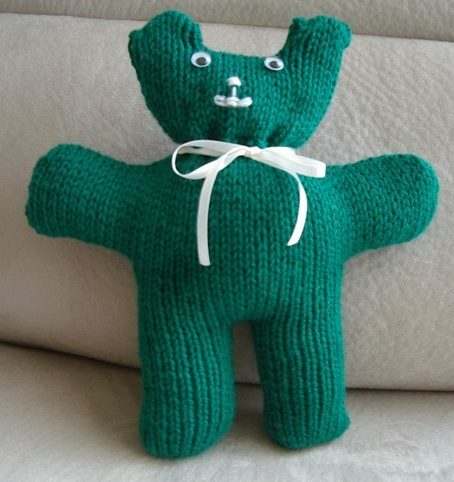 This easy to knit 12ply Teddy Bear is sure to be loved by kids of all ages. Teddy's height: 30cm [12 ins]. Yarn required: 1 ball Panda Magnum 12ply, 100g balls@185m. Needles required: A pair of 5.50mm [UK 5, US 9] knitting needles. Wool needle for sewing up and embroidery. Also required: Stitch holder or spare needle; washable filling; 2 wobbly eyes (optional); scraps of yarn for embroidery; 65cm [25½ ins] of narrow ribbon. Stitches used: Stocking stitch and garter stitch.